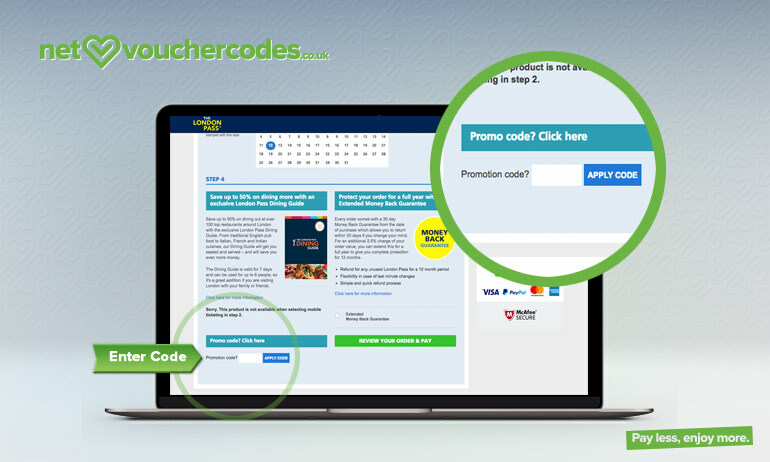 Where do I use my London Pass voucher code? "Sign up to The London Pass’ email service to be first in line for the latest offers, promotions and deals." "Don’t miss out on The London Pass’ sale, big discounts are available across their range of products including the 3-day, 6-day, or 10-day passes." "Optional oyster card available through The London Pass, offering additional savings on your travel expenses during your trip." Over 15 solid years in the tourist industry, The London Pass saves their customers money whilst enabling them to see and get more out of their time whilst in London. Ran by The Leisure Pass Group Ltd, an organisation comprised of leading travel and tourism experts, who are dedicated to ensuring visitors get the most out of their trips whilst spending less; specialised in identifying the best excursions and activities to do, The Leisure Pass Group operate in multiple major cities across the globe such as Paris, Berlin, Barcelona and many more. The London Pass features free entry to over 80 of the most popular tourist attractions in London, favourites such as Tower of London, London Zoo, Thames river cruise, Windsor Castle and many more. But wait, there’s even more, The London Pass isn’t just limited to free entry - a free 160-page guidebook to help you around London, a free 1-day hop-on-hop-off bus tour of London, 20 exclusive special offers for London and even an optional oyster card to help with travel. If you’re the type of tourist who loves to cram in as much sightseeing as possible then The London Pass is perfect for you, free access to all of London’s most iconic hotspots whilst reducing the cost of your trip overall - what more could you ask for? All passes come with a 30-day money back guarantee to ensure yourself peace of mind when ordering one. 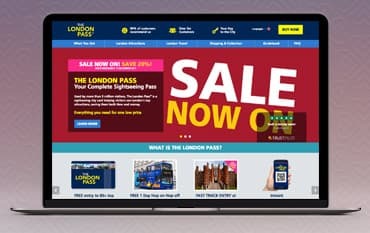 Set yourself up for an even cheaper trip to Britain’s capital and take advantage of The London Pass sale, don’t miss out - the sale is for a limited time only but there are huge discounts to be had on the range if The London Pass products, the 10 day pass, 6 day pass and the 3 day pass are all included. Book your trip well in advance to save the most amount of money possible, luckily The London Pass can be activated up to a year after it’s been purchased giving customers ideal flexibility and do not forget, each pass comes with a 30-day money back guarantee - organise your perfect trip to London with confidence. Check out The London Pass blog and find out the latest news, tips, insider knowledge and everything else London for your trip! Filled to the brim with practical information, ideas and activities - all useful for ensuring the time you spend in London is more meaningful. 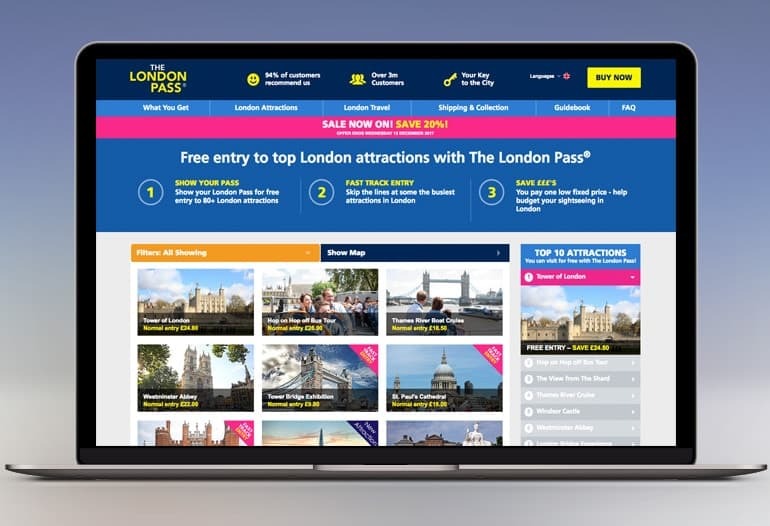 Don’t forget if you want to keep up to date with everything London, then sign up to The London Pass email service - subscribing entitles you to free updates, news and promotional offers provided by The London Pass. Prices - £2.95 - £35. Standard and FedEx Shipping Options to UK (up to 6 days) and Worldwide (up to 15 days). Instantly available via mobile ticket or free collection from The London Pass’ collection desk in Central London. When you purchase The London Pass online, you automatically receive a 30-day guarantee against any non-use of the product for free, giving you a full refund if you do not use and activate your pass. Created in 1999, The London Pass set out to make travellers, domestic or international, have a much more enjoyable as well as affordable experience whilst in London. Aiming to enable their customers to see more of London whilst actually spending less, included in the pass is access to iconic buildings, monuments, museums and more! Over the last 15 years, The London Pass has cemented itself as a tourist must-have whenever you’re spending time in England’s capital, having served over 3 million customers with a recommended rating of 94%, rest assured you’re in the best hands possible whilst on your trip. Ensure you take a look at The London Pass before your next trip to save the most amount of money possible, with even bigger savings when you shop with a London Pass discount code from us.